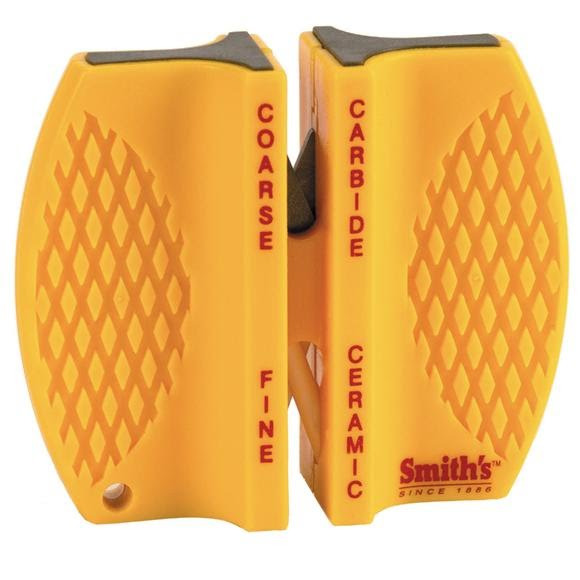 Smith's 2-Step Knife Sharpener features two tungsten carbide blades with pre-set angles to ensure the perfect edge every time. Three or four strokes through the carbide sharpening slots will restore the edge on a very dull knife. The two crossed ceramic rods also have pre-set angles and provide a smooth finished edge to already sharp knives. Smith&apos;s 2-Step Knife Sharpener features two tungsten carbide blades with pre-set angles to ensure the perfect edge every time. Three or four strokes through the carbide sharpening slots will restore the edge on a very dull knife. The two crossed ceramic rods also have pre-set angles and provide a smooth finished edge to already sharp knives. It is lightweight, portable, comes with a lanyard hole, and has non-slip rubber feet for added safety. Excellent for use on all types of knives, especially filet knives. Pull you knife blade straight back towards you while applying light pressure.